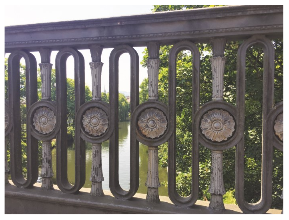 A logo was designed by Mytton Williams based on this research and incorporating the reliefs on Cleveland Bridge. The symbol from the bridge is shown in two colours: the bridge and its reflection in the river. The colour for the bridge was selected to represent the environment (trees, foliage, etc). The whole image symbolises a community setting, people gathered together in a circle, eating together or enjoying friendship, all of which which we feel are at the heart of Bridgemead.